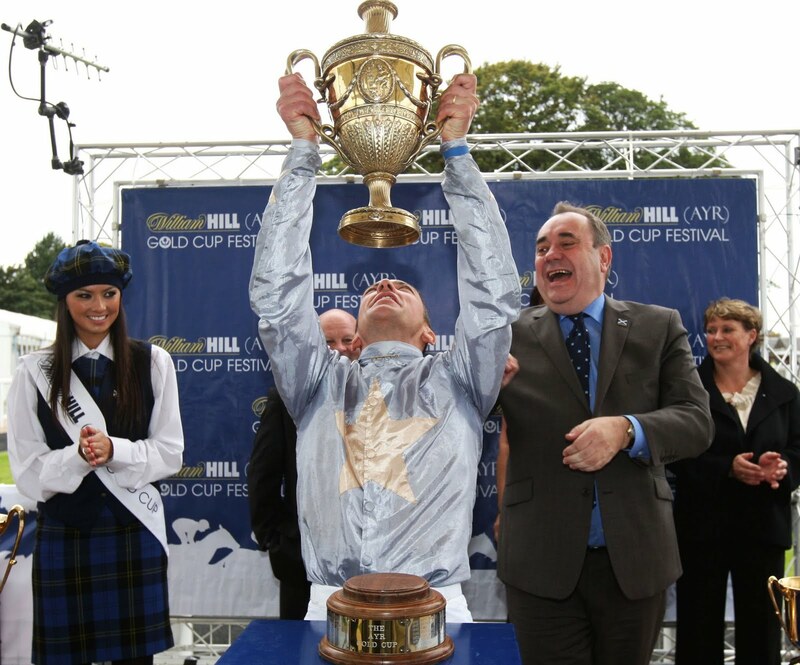 Jockey Frankie Dettori bowed before First Minister Alex Salmond on Saturday after piloting Redford to victory in the William Hill (Ayr) Gold Cup. The brilliant Italian wowed the crowds with a flying dismount after landing his second successive Gold Cup for trainer Dandy Nicholls who was winning the famous trophy for an incredible sixth time in 11 years. Sent off at 14/1 the five year old travelled strongly throughout the race and came with a flurry on the stand's side rail to lead inside the final furlong and power to a two and a quarter length win over stable mate Victoire De Lyphar (8/1) ridden by Adrian Nicholls. And oh how Frankie milked the occasion as he returned to the Winners Enclosure imploring the crowd round the paddock to cheer loudly as he prepared for his trademark flying dismount. And when he came out to receive his prize he bowed before the First Minister. But it could have been oh so different as Frankie missed his intended flight to Prestwick because he had forgotten his passport and Ryanair refused to let him fly. Frankie returned home to get his passport and flew instead to Glasgow from Stansted. Frankie made it a double on Saturday again emulating his achievements of last year when winning the williamhill.com Doonside Cup on board the Saeed bin Suroor trained Vesuve, the 2/1 favourite. Frankie again rode a well judged race and won by a neck from the front running King’s Gambit. The William Hill (Ayr) Silver Cup was won by Colonel Mak from the David Barron stable at the huge price of 33/1. Phillip Makin's mount had three quarters of a length to spare over Sonny Red (25/1) from the David Nicholls yard. 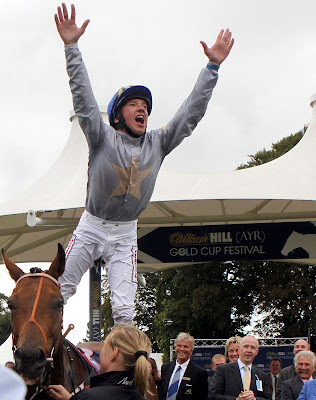 Trainer Richard Fahey had a tremendous three days winning seven races at the William Hill (Ayr) Gold Cup Festival including two on Saturday – Bridle Belle (7/2) under Lee Topliss in the Nigel Angus Memorial Nursery and Cosmic Sun, ridden by Paul Hanagan in the Ashleigh Construction Handicap. Hanagan himself rode six winners over the Festival including three winners on Friday the highlight being Arctic Feeling (8/1) in the Zenith Ltd Refurbishment Specialists Harry Rosebery Stakes for the South Ayrshire Cup. Oner of the best backed winners of the week was Cheveton (11/1) in the William Hill (Ayr) Bronze Cup holding on by a head from Courageous (13/2). In addition to Hanagan other jockeys in form during the meeting were David Allan and Phillip Makin who rode three winners apiece. Attendances over the three days were just under 21,000 with almost 12,400 attending Saturday's fixture – the second highest crowd at a Gold Cup Saturday in 20 years. Ayr next races on Thursday September 30 – Giles Insurance Raceday when the first race is at 2.20 pm. For more information go online at www.ayr-racecourse.co.uk or call 01292-264179. There are currently 778 Ayrshire business stories permanently archived on this site. To locate those of most interest to you, please use the site search facility in the top left hand corner of this page. Type your search term in the white box, then click the magnifying glass symbol. Magnificent musical magic you’d be mad to miss!